TFW they killed your fambly. Frank Castle is on a quest for revenge, waging a merciless war against the criminals of Hell's Kitchen. Well, not just them; it's not like the Punisher has a particular jurisdiction to worry about. It's not like if you can make it across 8th Avenue that he'll just stop chasing you or anything - the bio is only referencing Hell's Kitchen because Punisher first appeared in Season 2 of Netflix's Daredevil series, and that's presumably what this toy is based on (as opposed to his own Netflix series, which came out just about the time these toys were hitting shelves, and has a few cosmetic changes - it's not like we're trying to claim this figure is in the same boat as Blade or Bullseye, and belongs to the comicbook half of this "Marvel Knights"-themed line). 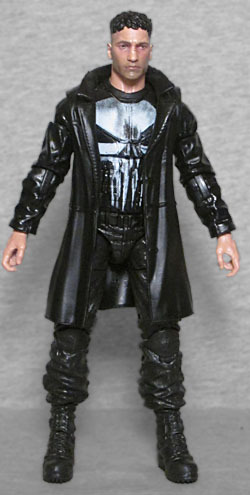 It's kind of a shame that the underrated Punisher War Zone didn't get a Marvel Legend, because if it had, you'd be able to stage a battle between all three (good) Punishers - as it is, we only have this one, with its Jon Bernthal likeness, and ToyBiz's Thomas Jane version. Come to think of it, you can't even do it with Minimates: they've got Bernthal and Ray Stevenson, but no Jane. Eh, we're getting off topic. 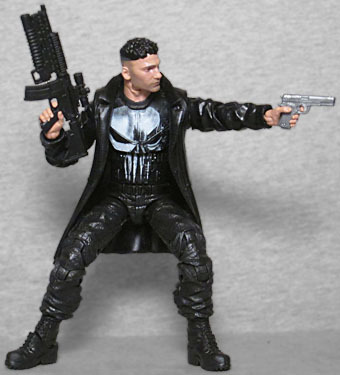 Punisher gets a new mold, though it doesn't look significantly different from the classic look - he wears a black coat, black pants, black boots, and probably a black shirt under his black bulletproof vest. Like, we get it, Frank, you're goth. 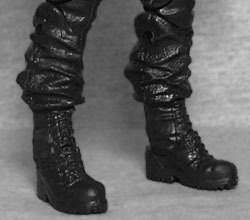 The boots have an impressive level of detail, particularly on the laces, and his pants bunch up where they're tucked in. While there have been Punishers wearing trenchcoats before, this one is shorter, ending above the knees rather than the ankles. 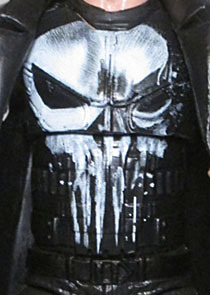 Netflix Punisher wasn't at all afraid to embrace the skull logo - adaptations tend to try to get away from it, apparently considering it silly, but in the show, the logo was Frank's idea, Frank's design, something he put on his own chest because he wanted to, not something that was handed down to him or he's wearing in honor of someone else. It's his thing. The scraped and faded look of the logo is painted amazingly well on this toy. The toy's face is painted with stubble and a black eye, both quite subtle. The face paint is the new "printed" style, so you know the likeness ends up looking good. The articulation is typical for Marvel Legends, with joints at the head, neck, shoulders, biceps, elbows, wrists, torso, hips, thighs, knees, and ankles. He's armed with a gray pistol and a black rifle. The pistol is a Para 1911 G.I. Expert, with a slightly longer barrel than usual, while the rifle is an M4A1 with a grenade launcher underneath (standing in for the similarly modded SIG-Sauer 516 he used in the show). They're nice pieces, but still: every Punisher always needs more guns. Two isn't enough for him. Of course, if they had given him enough of an arsenal to suit him, there wouldn't have been room in either the budget or the package to include his Build-A-Figure piece: Man-Thing's left arm. Punisher may not be very heavily armed, but he was a fan-favorite in Daredevil Season 2 - enough to get his own series - and the toy delivers the usual high quality we expect from Hasbro.